I've been working on a new cookie recipe, since I want to be able to bake up a variety of cookies for Christmas. 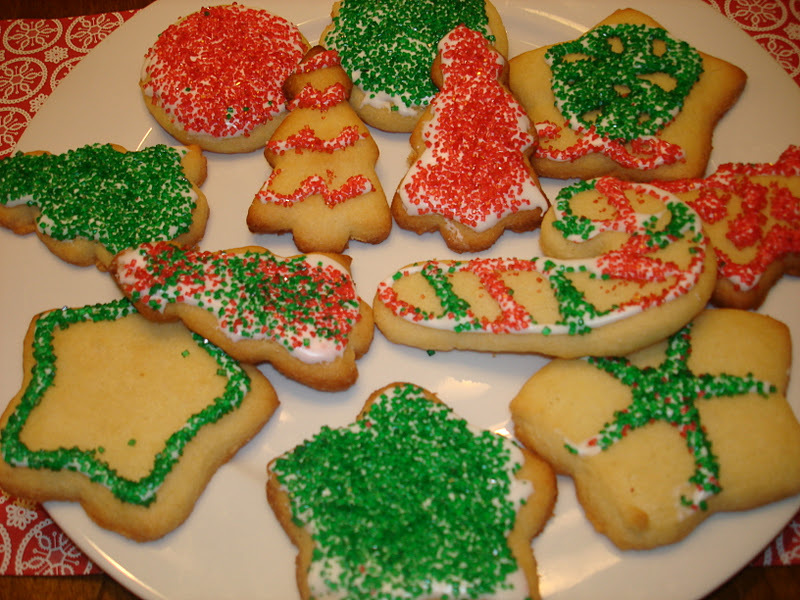 I've created a basic gluten free vanilla sugar cookie recipe that tastes good and holds up without crumbling or being hard as a rock. My husband even thinks they taste better the next day! 3/4 cup butter (I used Earth Balance Vegan Buttery Sticks). Should be at room temperature. 2 eggs (at room temperature). You can use just the yolks if you prefer, but I use the whole egg. Preheat oven to 400F only after refrigeration of dough is complete. 1- In a mixing bowl, stir together white rice flour, all purpose flour, baking powder, salt, and xanthan gum. Put aside. 2- In a separate mixing bowl, cream together butter and sugar. Add in eggs and vanilla extract and beat until mixed through. 3- Add dry ingredients to the wet ingredients, and beat until mixture is smooth. This can be done with a mixer, but I just did it by hand. 4- When thoroughly combined, roll dough into a ball, wrap in plastic wrap and refrigerate. I made half a batch of cookies after one hour in the fridge, and the other half after refrigerating overnight. The cookies turned out roughly the same, but the dough was much easier to work with after being chilled overnight. 5- Lightly flour the counter, and place a piece of plastic wrap over the dough to roll it out. Roll the dough to desired thickness. 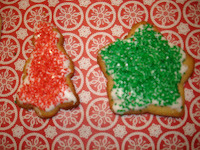 For crispy cookies, roll quite thin, and for chewier ones roll thicker. They will rise a bit, but not too much. Cut into desired shapes or roll into balls and flatten. 6- Place on a greased cookie sheet and place in oven for 6-8 minutes. Take out when edges begin to brown. 7- Place on a cooling rack and gently life bottoms from cookie sheet, then allow to cool. 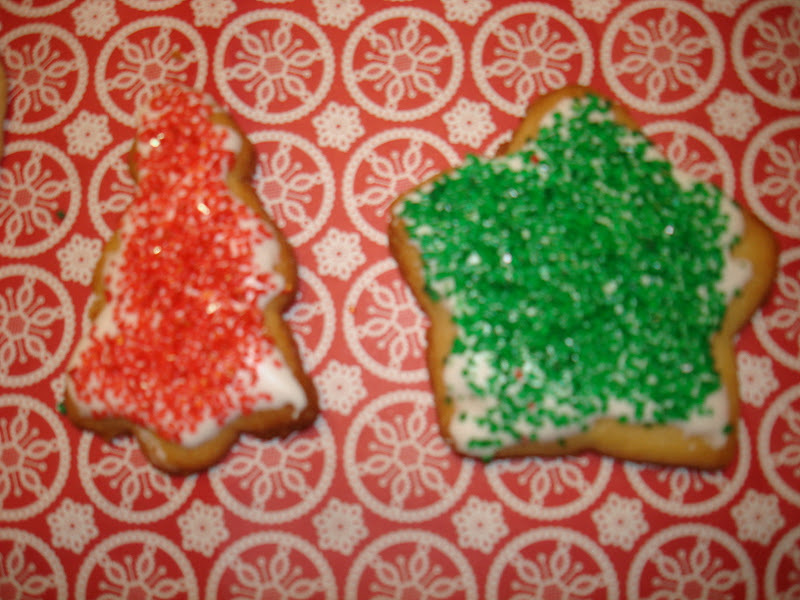 8- Decorate with icing and sprinkles, or eat plain. I'm going to try my next batch with a cookie glaze. These cookies will hold their shape well and don't crumble. To change the flavour, substitute a different extract for the vanilla extract. To cut perfectly round cookies, roll dough into a log before refrigerating and then just cut into rounds when ready to bake.